This is the original article in it's entirety. In a Duck Sports Authority Exclusive interview with several close relatives of Lache Seastrunk, as well as Deanna and Scott Carter the nature of the relationship between Deanna Carter, Scott Carter, Willie Lyles, Lache Seastrunk and his extended family became much clearer than has been depicted. a woman working hard at her job. But she also found time to include Lache in her life. From talking to Lache Seastrunk's family, one thing is very clear; this is a young man with a huge heart, an infectious smile and a generous spirit. He loved people and accepted them into his life as if they were his own. The Seastrunk family is a very strong and loving family, through all of the well-chronicled troubles Lache experienced, there was one constant in his life. According to an uncle who was very close with Lache, his grandmother Annie, whom Lache affectionately calls 'Nana' was the one constant in his life. She made him the man he is today. Nana taught Lache the true spirit of respect and Lache will always refer to his elders as “sir” or “ma'am.” According to Lache's family, everything he is he owes to her. This does not neglect the true feelings of Evelyn Seastrunk. Through the documented troubles, Evelyn loved her son; she wanted nothing but good things for Lache. She always favored LSU as a destination for Lache. Many people had heard rumors and were concerned that, due to Lache's incredible warm heart, that he might have let a bad influence into his life. Nonetheless, neither the family nor Deanna saw much of Will Lyles. In independent interviews two very close family members and Deanna all say they only saw Will Lyles at a Temple football game on two occasions. A very close family member had to be reminded who he was later as he had only met Will one time during a football game. That is how little Will Lyles was around Lache's family. Mrs. Carter, in a lengthy interview, remembers that “from probably Christmas of his junior year until around October of his senior year I had assumed that Lyles was out of the picture.” Lache wasn't talking much about Lyles. In a surprise revelation, Scott Carter admitted that after a while, Will Lyles began to distance himself from Evelyn. Starting in about October 2009, Lache started talking to Deanna Carter about Lyles. Knowing how she felt about Lyles, Seastrunk asked her to talk to Lyles on the phone. After speaking with Lyles, she was surprised to find out that Will said he, too, only wanted to help Lache be successful where ever he may have ended up in his decision process. Nonetheless, Mrs. Carter wanted to be sure that she had some control and not allow a man who barely knew Lache to have too much control over his life choices. Deanna and Scott Carter's relationship with Lache was very real. Deanna went to the Army All-American game; Scott and Deanna were at his press conference, wearing Duck gear when Lache announced his decision. And, make no mistake, Lache was close enough with the family that he was at their son's birthday party. All along, Deanna was his counselor. And, to be fair, her assistance went beyond talking about recruiting. According to Lache's family, she was very instrumental in helping him with many aspects of school including testing, homework, planning, study habits; all of the things that good counselors do for their students. While Lache may have thought she might have become too protective of him, he did listen to her and she was a major influence on him. an already extremely talented young man. Lache was getting a scholarship; he was going to a major university and needed no help getting there. When it came time to give advice about schools, most of the family was convinced it was either LSU or Texas; but Lache was not as interested in Texas as the other schools. As previously reported, Lache Seastrunk had developed a strong bond with LSU Running Back coach Larry Porter. In fact, the bond was strong enough that, when Porter left LSU to become the Head Coach at the University of Memphis, Seastrunk strongly considered Memphis as a possible destination. Lost, though, in today's continuing headlines, is the pain that all of the negative attention has caused the rest of the Seastrunk family. Lache has young cousins who look up to him as a great example; the wild accusations are bad enough. But this is not the worst of it for the family. Many of Lache's family are long time, die-hard, Texas Longhorn fans. The family has had to endure being cursed at and ridiculed in public over the alleged actions of Will Lyles. And that is a shame. These family members have done everything they could to help raise Lache. As one family member states “that old saying about it taking a village, Lache had a village. And we, his family, were a big part of that village.” And he is right, the village did help with Lache. When it came to his recruitment, though, most of his family went against advising him about his final destination. All of his family agreed that it needed to be his decision. The only advice one family member ever offered was regarding USC. Just as it was becoming evident Pete Carroll was leaving for the NFL, Lache was still considering them. And the only advice he received was simple “Do you really want to go someplace that is about to get sanctions?” That was it for family advice. The Oregon visit truly made an impact on Lache Seastrunk. Prior to the visit, he had Mrs. Carter fill out a single college application. His visit changed everything, as he confirmed to Duck Sports Authority just following the visit. "It's nice," Seastrunk said. "I like the way they run the offense. It really opens you up and puts you in space. I really like this offense. I also like Coach Kelly, he's very offensive minded. “I like it here in Eugene," said Seastrunk. "It's just like back at home, real quiet. I really don't do a lot anyway, so I see this as a perfect fit. “I'm having a great time," began the coveted recruit. "This is a really great experience. Everybody is welcoming me with open arms. They're open to me. I can't even explain it I'm having such a good time here." When it became clear to Mrs. Carter that Lache was now down to Oregon and USC as his final two choices, she did feel, and advised Lache of this, that Oregon was a better place for Lache because it was a considerably safer environment for a young man. Evelyn was most certainly upset that her parental rights had been circumvented. As one family member put it “how would you feel if someone signed something that took away your rights as a parent? Regardless of what she had done in the past, she felt very hurt by this action.” Nonetheless, on January 27, 2010, Lache made public his intent to attend the University of Oregon. At this point, it was still one week before the first day he could sign his letter of intent. The school held a press conference where he announced his decision in his high school gym. He came out in a Duck shirt, blew on a “duck call” and announced he would be attending the University of Oregon. While Evelyn Seastrunk was hurt and upset by the process to allow Annie Harris to sign the letter of intent she, like all of Lache's aunts, uncles, cousins, family and friends, expressed a great deal of happiness for Lache. Despite the desires of everyone, Lache had truly made his own decision. And this is a fact no one denies. 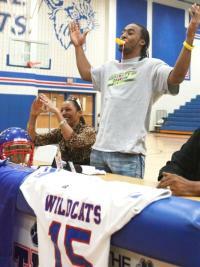 Oregon was Lache Seastrunk's choice. Lache's family supported his decision because this was his moment. No one was going to take that moment away from Lache Seastrunk. His family and friends gave him the room and advice to allow him to make a decision, as any good family would. When it all boils down, the influence of Will Lyles, while real, was nowhere near as powerful as many have suggested. He had known Lache for a scant 18 months when Lache made his announcement. He had been to all of TWO Temple High School football games during that time span (which encompassed 2 football seasons). Throughout all of the recent news, one thing has remained constant, Lache Seastrunk has grown to truly love Oregon. When he calls home to talk to family, he has begun to rave about Oregon. In fact, while we were talking to one family member, Lache showed up at their door for a visit. With summer conditioning over, and a week of free time, Lache went home to visit family and friends. It was a whirlwind tour, to be sure, but he saw everyone before heading back to Oregon. This trip back will certainly be different than his trip in 2010. This time, Lache is comfortable in his surroundings. Focused and working hard. In June 2010, shortly after graduating from Temple High School, Lache Seastrunk came to Oregon in the car with Deanna and Scott Carter. The Carters used their vacation time to drive Lache to Oregon. Along the way, they were able to spend some time in Boise with one of Lache’s elementary school teachers. Everyone was put at ease when they learned that Lache would be roommates with Erik Dungy, Tony Dungy’s son. They could not have hoped for a better situation for this young man. And, yes, Deanna Carter cried as she dropped Lache off in Eugene. As a final piece of pre-college advice, Scott Carter offered these words to Lache, “I told him that day that it was time for the training wheels to come off, that everything he had worked for and learned he was going to have to begin doing on his own, and that I was very proud of him. Then I told him that this was just the beginning and that he was going to have to work harder than he ever had to prove himself to Coach Campbell and the staff AND the team. I told him to not dare allow the gifts and opportunities God had given him to go unfulfilled, that neither he nor I had a clue what His plan for him was but to know that there WAS a plan, all he had to do was work hard in the classroom and on the field and God would handle the rest.” Along the road from Temple, Texas, through Boise Idaho, to Eugene, Oregon, Deanna and Scott Carter, their two sons, and Lache Seastrunk shared memories, laughs and a great road trip. The road to Oregon was not always smooth, but along the way, the village that was Temple, Texas, and Lache Seastrunk's extended family took care of him. He had an uncle that gave him the most sage advice ever. As a kid, Lache actually wanted to be “like Mike.” He was dunking the ball in 8th grade at a whopping 5'8”! But, his uncle knew that he was not going to be much taller than 5'10” and told him “you better worry about carrying a ball and not shooting.” It wasn't until about Lache's junior year of high school that he began to see the light and understand he was probably just about done growing. Football was his ticket, not basketball. His uncle had been right. time, was able to wield some mysterious power over an otherwise strong, independent young man is almost ludicrous. To hear his family speak, most of them never saw Lache and Will together. From talking with his family, it is clear that his extended family have always had his best interests at heart. In the end, one thing became abundantly clear in speaking with his family, Willie Lyles did not steer Lache to Oregon. Willie Lyles was not at Lache's press conference to announce his college choice. By dismantling the "mentor" relationship Lyles claimed to have had on Lache, his alleged influence is dismantled. After his initial home-sickness, Lache Seastrunk raves on and on about the University of Oregon every time he calls home. It is safe to say that after all the turmoil he has faced, he is truly happy with his decision. Duck Sports Authority can also say that contrary to public reports, based on conversations with several family members and Deanna Carter, Lache has not talked to Willie Lyles in a long time. He has promised his family to avoid Willie Lyles, and that is probably a good thing. Lache Seastrunk does not need to muddle relationships anymore. As Lucas Clark from the Oregon Daily Emerald reminds us, 'Nana' was the disciplinarian in his family, she provided his foundation for life. If he needs a positive role model and mentor, he need look no further than Nana. And, of course, his extended family. Mentoring young men is a privilege. Many people are incredible role models for these young men as they grow. Unfortunately, some of these young men have promise and potential beyond the comprehension of “mere mortals.” But as many know, the toughest thing you can do with a young man is teach him how to make decisions and then allow him to do so. It becomes a natural instinct to “step in and save him” from what you think is a bad decision. But to truly let him learn, you must allow him to make that bad decision. You cannot be there forever. As for the Willie Lyles' of this world, it is time they stopped trying to use their relationships with these young men for profit. If you want to mentor young boys, be a coach; become a “Big Brother;” step into your community and volunteer. Each and every one of the men who step in and attempt to make a living off of the backs of these young men should step back and ask if that is what they would want for their own child. We can confirm that there are members of Lache Seastrunk's family that will never allow Willie Lyles near their children. So, in some ways Lyles has certainly made an impact, but is this how anyone wants to be remembered? Step back, remember, all this money you make off of these young men, it is simply going to be dust in the wind when you pass on to the next life and then you will have to answer to One Man for your mistakes. What is left are shattered stories of a family stronger than anyone knows. Lache has a great family, he has many people in his life who truly love him. What can be learned from all of this? There is nothing stronger than Love. Love is what brings the world hope and faith. Love is what brought Lache Seastrunk through a life more difficult than most can imagine. A village raised Lache Seastrunk. A village made Lache Seastrunk his own man. A village gave Lache his voice. It was that voice and that voice alone that chose the University of Oregon. For the village, it can be said, they love their Lache. He is a one of a kind young man. The village did their job. For them, seeing Lache's smile when he chose Oregon made it worth the struggle. There are several great mentors in Lache's life; a counselor who cared deeply for this young man; an uncle who was firm and strong, a man that recognized Lache had enough people patting him on the back, he needed someone to be straight with him. A cousin who was already in college playing football. A family friend as much a mentor as anyone. And, yet, with this village raising Lache Seastrunk, the world need look no further than one person for the incredibly strong, driven, faithful man named Lache Seastrunk. Annie Harris. 'Nana.' And, as his family tells us, they can guarantee she feels he was really worth it. Reason for being in Portland?